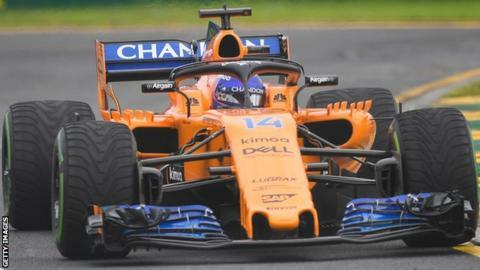 The two-time champion, who left Formula 1 at the end of last season, will drive for two days at the official F1 test after this weekend's grand prix. McLaren want Alonso's views on how much their car has changed since last year, one of the worst in their history. He will drive all of Tuesday and then the afternoon of Wednesday, taking over from race driver Carlos Sainz. The team's other race driver, Lando Norris, will share Tuesday with Sainz and get a whole day in the car on Wednesday. Alonso will be in a car devoted to tyre testing for Pirelli. F1's tyre supplier runs the programme and decides what tyres to use, but it will give the 37-year-old plenty of time to assess the car. McLaren's 2018 car had fundamental design flaws that affected the team's ability to develop it. They believe they have solved the issues for 2019 but Alonso will potentially give them a clearer view of progress than Sainz and Norris, who have very limited experience of last year's 2018 car. Alonso, who in February was confirmed as a McLaren ambassador and adviser, will spend the Bahrain Grand Prix weekend with the team. Alonso is to race for a newly established McLaren team at the Indianapolis 500 in May, in an attempt to complete motorsport's unofficial 'triple crown' of Indy, Le Mans and Monaco Grand Prix.